Most states in America have laws that don't allow tattoos for a minor without the presence or written consent of a parent. Some states go further to prohibit tattoos on the under-18 set entirely. If a parent is considering letting their teen get some ink, though, there’s a lot to think about when it comes to safety. The American Academy of Pediatrics has addressed those concerns in its clinical report, “Adolescent and Young Adult Tattooing, Piercing, and Scarification,” released in September 2017. As a parent, you might have some questions. Is This Really Something I Need to Think About? You might be totally against tattoos or totally OK with them, but according to the report, there are tattooed teens out there. AAP notes a study of high school students found 10 percent had tattoos, while 55 percent of students were interested in tattooing. Girls were more likely to be tattooed and/or have a body piercing (research did not distinguish between the two) than teen boys. In other words, even if it seems like your teen is too young to even be considering a tattoo, it might be something that a parent needs to think about. Here’s the good news: The rate of complications from tattooing is pretty low, says AAP. What is a concern, however, is the possibility of infection. Potential causes for infection include contaminated tattoo ink and/or needles and a poor job of disinfecting the skin to be tattooed, which can result in bacterial contamination. While it might be rare, the result isn’t pretty—potential infections include Staphylococcus aureus (i.e., a staph infection) or Streptococcus pyogenes. Infections might not show up immediately, but anywhere from the fourth to the 22nd day after tattooing, you’ll see signs of infection such as pustules along the tattoo lines. An unclean method of tattooing can also transmit viral infections through bloodborne pathogens. These might include hepatitis B, hepatitis C, or even HIV. As a parent, you might think that henna tattoos are a good substitute for traditional tattoos. After all, henna tattoos aren’t permanent and they can be a fun way for a teen to see what it would be like to have some ink on her body. The AAP has issued warnings for this traditional form of body art, which dates back to the Bronze Age in the Middle East. Red henna is generally considered safe, according to AAP, and any adverse reactions would occur because of hypersensitivity to the pigment. However, black henna could be a cause for concern. Because black henna doesn’t exist naturally, the chemical PPD is added to darken the color, enhance the design, speed up the dyeing and drying process, and make the tattoo look more realistic. Because there’s no skin puncturing during henna tattooing, there’s no risk of bloodborne pathogens. There is, however, a small risk of allergic reaction and allergic contact dermatitis, and the reaction can be severe. It’s no surprise that teens don’t always think of the lifelong ramifications of their choices. AAP recommends having a serious discussion with your teenager about societal acceptance of tattoos. 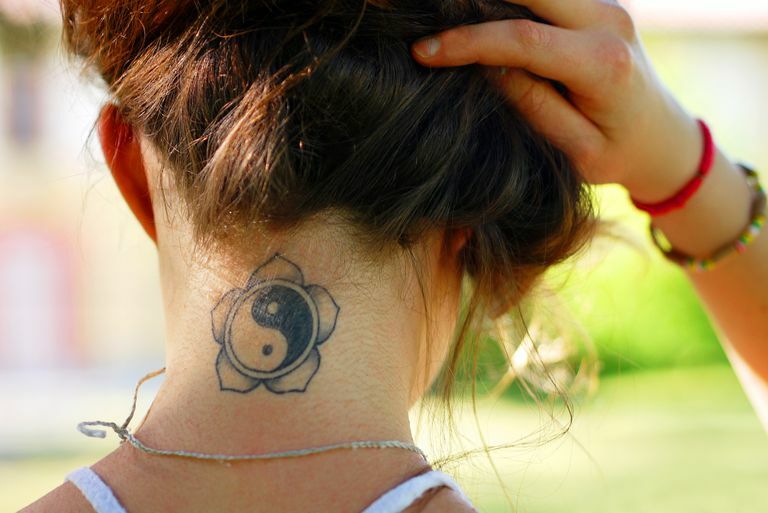 While people are increasingly accepting or approving of tattoos, there can still be significant judgment. AAP cites a 2014 study that found that 76 percent of respondents believed that their tattoo or piercing hurt their chances of getting a job. Additionally, a 2016 study published in the Journal of Retailing and Consumer Services found that customers have a preference for non-tattooed frontline staff, which could affect a future hiring manager’s decision. If your teen has a history of keloid formations, avoid any body modifications that puncture the skin—that includes tattoos. Talk to your pediatrician about precautions you might take when selecting a tattoo artist. The AAP recommends doing some serious research on the sanitary practices of both the tattoo parlor and the artist. Important hygienic practices include using disposable gloves and using new needles and equipment. It's also important to observe the artist taking the needle from a sealed, sterile package. After getting a tattoo, keep the bandage on for 24 hours and then wash it with soap and warm water. From there, apply antibiotic ointments, skin cream, or vitamin E oil regularly. Avoid using petroleum jelly, rubbing alcohol, or peroxide, and skip swimming, sun exposure, hot tubs, and long baths. If there’s any sign of infection, go see a doctor (if possible, a dermatologist). It’s not an easy decision to allow your teenager to make a choice that lasts a lifetime. And while tattoos can be removed if your teen later regrets her ink, the process is expensive and painful, and sometimes it’s not particularly effective. If you’re considering saying yes to your teen’s request to get a tattoo, take safety into consideration. And don’t forget about other potential drawbacks, too. If you’ve decided you’re not interested in letting your teen get a tattoo, hold conversations with your teen about the potential risks involved. The last thing you want is for your child to go to a tattoo parlor who gives underage kids tattoos without parental consent. And you certainly don’t want him giving himself some ink with the help of some friends and homemade equipment. Baumann C, Timming AR, Gollan PJ. Taboo tattoos? A study of the gendered effects of body art on consumers attitudes toward visibly tattooed front line staff. Journal of Retailing and Consumer Services. 2016;29:31-39. Breuner CC, Levine DA. Adolescent and Young Adult Tattooing, Piercing, and Scarification. Pediatrics. 2017;140(4).